Determined to empower their colleagues and community partners to tackle challenges and make smarter decisions using data, a workgroup of two in Charlotte, North Carolina, took on an ambitious challenge: cataloging all the city’s datasets. In a way, it seems that we stumbled upon this task. 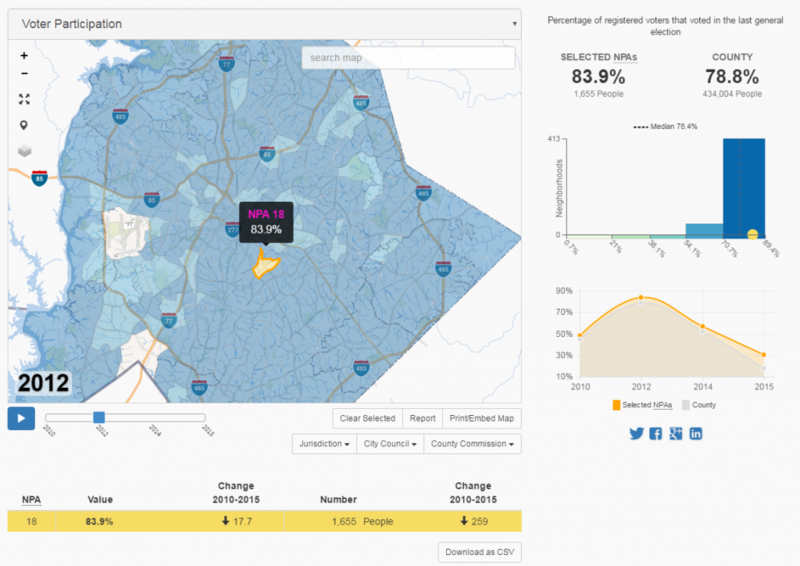 In 2014, we were hired and charged with revamping the Charlotte-Mecklenburg Quality of Life Explorer, a dashboard where residents can explore neighborhood data across a wide range of indicators, from health and education to housing and transportation. In 2012, data from the decade-old Quality of Life Study was brought into an online dashboard for the first time, but after two years, both the data and the dashboard needed a refresh. The task was a great fit for the two of us as we’re information-sponges, problem-solvers, and mortal enemies of ambiguity and misinformation. So how did we get from neighborhood indicators to a dataset census? It wasn’t long into our time at the city when the Mayor requested that staff compile information on all of the city’s activities and investments that occurred in the Hidden Valley neighborhood over the last ten years. Being the staff that worked on the neighborhood indicators project, it was our job to have great data on the neighborhood’s quality of life; however, we had no central location from which to examine what government services were being delivered. We could say what the neighborhood looked like, but we couldn’t tell you what was happening there. While it only takes two clicks to get a snapshot on current conditions (Click here! ), it took nearly three weeks for two staff to wrangle historical and current project information from departments in order to cobble together a spreadsheet with the information requested. At the surface, it seemed simple: What activity occurred, and when was it completed? How much did it cost, and what did it look like? But it was anything but simple, and it was a wakeup call, particularly as the city began to experience an increase in open records and open data requests. I’m not sure how long is “too long” to answer a question from the mayor, but I am fairly sure that three weeks is beyond that. That fire drill got us thinking about how we in Neighborhood and Business Services could better prepare ourselves to fulfill these kinds of requests and, just as importantly, be able to tell the department’s story of what we do in neighborhoods on a daily basis. For example, all of the 93 projects from other departments for the Hidden Valley request were capital projects. Neighborhood and Business Services had 68 projects ranging from youth engagement to neighborhood grants, every activity requiring real interaction with the residents. Recognizing that the ability to quantify city activity in neighborhoods is invaluable, last year, we set out to catalog and centralize these data across the department. We made it through a few meetings before some staff left and new projects arose, but the idea never left our minds. It turns out that our love of data and problem-solving quickly led us from working with residents on understanding what is happening in their neighborhoods to working on city-wide issues. Earlier this year, the two of us were moved to the Office of Strategy & Budget, where we are now asked (sometimes, we are the ones doing the asking) larger questions about the city as a municipality and as an organization. Meanwhile, we are beginning work to foster a culture around asking questions, using data, telling stories with data, and empowering people to discover new insights and solve problems. Data are the very bedrock of this work; the dataset census began this month and should be complete this winter. A native Charlottean, Andrew Bowen works for the City of Charlotte, North Carolina, as a Community Research Specialist. He holds a Bachelor’s of Science in Economic Geography and a Master’s of Arts in Urban & Regional Analysis / Transportation Studies from The University of North Carolina at Charlotte. As a geographer, he is slightly enigmatic in the sense that he gets lost easily, even in his hometown. He enjoys examining different aspects of what drives quality of life, particularly proximity to coffee and transit ridership (he rides the bus every day). Outside of work, he is usually either running and biking around his neighborhood or moonlighting as a whitewater raft guide at the U.S. National Whitewater Center in Charlotte.